What a week Viktor Fasth has had. He has gone from unknown Swedish goaltender, to NHL star in a matter of a couple weeks. He has started 6 games, and won them all. He didn’t just win the games however. He dominated them. Through those games, his save percentage of .933 and goals-against average of 1.74 is outstanding (even more outstanding before last Saturday’s 5 GA performance against St. Louis). 3 of his wins came via shootout, including his first career start. I can’t stress it enough. If he’s available, pick him up. This 30-year old goalie may not be a rookie, but this unbelievable start to his NHL career is one for the record books. Jonas Hiller (G – ANA) remains injured (DTD) with a lower body injury, but may return as early as this weekend. Miikka Kiprusoff (G – CGY) skated, but because of a “slight grade two MCL sprain,” he is expected to miss another week or two. Brendan Smith (D – DET) will not return in February due to a lingering shoulder injury. Jonas Gustavsson (D – DET) is practicing, but without a set timetable for a return. Mikael Samuelsson (F – DET) is practicing as well, and his return could be as soon as this weekend. Todd Bertuzzi (F – DET) has been sidelined with a back injury and has already missed a few games. He’s listed as Day-To-Day with no specific return date. Josh Harding (G – MIN) is Day-To-Day after “feeling off” after taking a different medication for multiple sclerosis according the Minnesota Wild’s official website. Patric Hornqvist (F- NSH) is out with a knee injury. He is skating, but not practicing with the team. Erik Karlsson (D – OTT) is likely out for the year after his left Achilles tendon was lacerated by Matt Cooke Wednesday night. He will require surgery. Scott Hartnell (F – PHI) is still on IR due to a foot injury. No timetable for return has been set. Kris Letang (D – PIT) has been activated from IR after suffering a lower body injury. Jaroslav Halak (G – STL) aggravated his groin injury Monday night and continues to miss games. He may return on Sunday at the earliest. Ryan Malone (F – TB) will be on injured reserve for at least 10 days (possibly 3-4 weeks) due to a lower body injury. David Booth (F – VAN) is skating, but is still out because of a groin injury. Ryan Kesler (F – VAN) is practicing, but there is no set return date. Brooks Laich (F- WSH) has been cleared for contact after suffering a groin injury, but will not return just yet. Mike Cammalleri (42% F – CGY) just returned from injury after missing 3 straight games. In his first game back, Mike scored a hat trick and added an assist against the Dallas Stars. Lubomir Visnovsky (88.2% D – NYI) is finally back playing in the NHL. In his first 3 games back, he registered 3 assists, playing 22:30 a night on average, and carrying a +1 rating. Since he’s on the Islanders, I can’t guarantee that he’ll continue to have good +/-, but he’s usually a dependable fantasy blueliner. Tyler Bozak (45% F – TOR) has scored 4 points in his last 3 games including 2 goals and 2 assists. In total, he has 4 goals and 5 assists for the year. 5 of those 9 points came on the powerplay. Francois Beauchemin (56.1% D – ANA) has never scored more than 34 points in a season (2005-06 season), but this season he has 6 points (2 goals and 4 assists) through 12 games. 5 of those points came in the last 5 games (4 points on the road). He logs around 24 minutes a game and is a +10. He also has 22 hits, which makes him an overall good fantasy player. Anaheim is red-hot right now also. Lee Stempniak (16.6% F – CGY) is a +5 on a very weak (defensively) team. That’s really saying something, because Calgary has given up 6 more goals than they’ve scored. 3 of his 9 points (5 goals, 4 assists) came on the man-advantage. In his last 4 games played, he has scored 2 goals and 2 assists. He plays on Cammalleri’s line, which can’t be a bad thing. 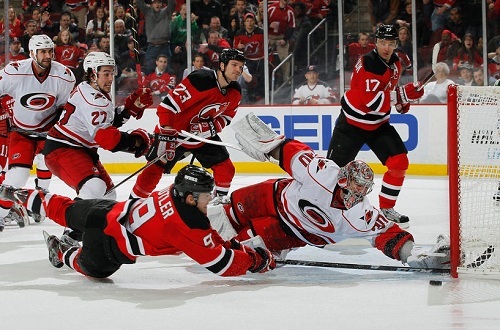 Travis Zajac (48.4% F – NJ) has gone pointless in his last 7 games. His last goal was on January 22nd. He’s as cold as they get. Martin Havlat (82.6% F – SJ) has 0 points in his last 5 games. In those 5 games, he was a minus-4. For a goal-scorer, he only has 3 goals and 2 assists after 13 games. He has a -1 rating for the season. Apparently Marleau was hogging all the goals. Zack Kassian (55.3%) is done pretending to be Wayne Gretzky. After Alex Burrows replaced Kassian on the first line, his production tanked, as expected. He went from having 5 goals in 6 games, to 0 goals in his last 5 games. His 27 hits (5 hits in his last game) are still very good. Ward has won 4 of his past 5 games, giving up 4 goals twice (once in a loss, once in a win). The story here is that the Hurricanes are winning games. His last start was a 2 goal-against win the Devils in New Jersey. The young team is quickly improving. Varlamov has lost his last 3 starts, all at home (Phoenix, Anaheim, Dallas). In his last 7 games, he’s lost 6. His record now stands at 3-6. He’ll eventually come back to form, but for now, look for goaltending help elsewhere. The Washington Capitals are struggling mightily right now. He managed to shut out the Florida Panthers a few games ago, and he has won his last 3 starts, but only because his team bailed him out. In his last 2 starts combined, he has allowed 8 goals, bringing his season GAA to 3.90 and SP to .877. The joint Jennings Trophy recipient last season was supposed to bridge the gap in the Central Division while Jaroslav Halak was injured. However, this wasn’t the case. His last 5 games all resulted in losses. In his last 7 games, he has given up 4 goals three times, and 5 goals twice. His season stats includes a 3-5 record, 3.57 GAA, and .849 SP. Halak will likely be returning very soon. Hold off on signing the other Blues netminders. MacDonald will receive a decent amount of starts while Miikka Kiprusoff is injured. Leland Irving took over temporarily as the starter in Calgary, but MacDonald has more NHL experience. Look for him to perform well, despite shaky defense. Bobrovsky has split the time in net more equally with Steve Mason after he struggled early in the year. His record in 7 starts only includes 2 starts. .896 SP and 2.98 GAA are simply not good enough. Currently Reimer is on injured reserve, but don’t expect him to miss too many games. He’s won 3 straight games. In his first 6 starts this year, he gave up 4 goals twice. In his last 3, he recorded a shutout, a one-goal-against win, and a two-goal-against win. His stats have improved to .929 and 2.31.